Formwork is a mould for a structure. Into this mould, fresh concrete is poured to harden the concrete. The construction of formwork takes time and involves expenditure upto 20 to 25% of the total cost of the structure or even more. Design of these temporary structures are made to economic expenditure. The operation of removing the formwork is known as stripping. Stripped formwork can be reused. Reusable forms are known as panel forms and non-usable are called stationary forms. Timber is the most common material used for formwork. The disadvantage with timber formwork is that it will warp, swell and shrink. To overcome these issues, MIVAN Formwork came into lame light there are many uses and even profits when compared with the timber formwork. Mivan is an aluminium formwork which is also called as MIVAN Shuttering. This type of formwork is first developed by a European construction company. 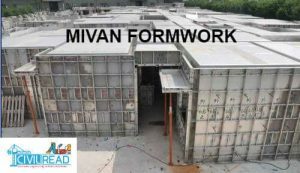 In 1990, the Mivan Company Ltd. from Malaysia started manufacturing these formwork systems. Today, more than 30,000sqm of formwork from Mivan Co. Ltd. is used across the world. The MIVAN formwork has proven economical as well as satisfactory for the overall construction environment. Mivan technology is mostly suitable for constructing large number of houses in a short span of time using room size forms to construct walls and slabs in one continuous pour on concrete. 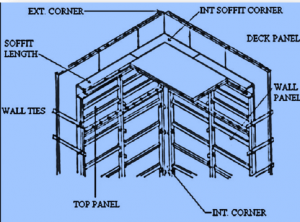 Aluminum formwork is very cost effective for repetitive Building layouts and for above the plinth work. This system is very unique as all the components in a buildings, including slabs, beams, walls, columns, staircases, balconies and special window hood are of concrete and there is no need for block works or brick works. It consists of four components Beam components, Deck components and wall components these all are made of high strength aluminium alloy. The modular nature of the Mivan aluminium formwork system allows easy assembling and removal of formwork. The construction can proceed speedily with very little deviation in dimensional tolerances. This System is quite flexible and can be easily adapted for any variations in the layout. 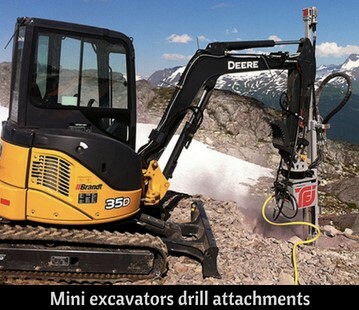 MIVAN aims in using modern construction techniques and equipment in all its projects. On leaving the MIVAN factory all panels are clearly labeled to ensure that they are easily identifiable on site and can be smoothly assembled together using the formwork modulation drawings. All formwork begins at a corner and proceeds from there. In this step, the wall reinforcing steel is used to form structure to the building, This reinforcement steel gives support to the concrete till it reaches 50% of designed strength. This steel mesh is Pre-casted in factory itself and can be easily erected on construction site. As mentioned, MIVAN formwork is a ready-made one, Formwork is designed and manufactured in factory itself as per the required sizes of slabs, columns, beams, staircase and other structural elements of the buildings. 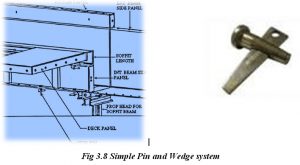 By Pin and wedge system formwork is easily assembled on site. Formwork can be easily dismantled from the structure once the job is done. Once the formwork is placed, Freshly made concrete is poured inside the formwork to form the shape. Once the concrete gains required strength, the formwork is dismantled from the structure. The beams are held in position by a simple pin and wedge system that passes through holes in the outside rib of each panel. The panels fit precisely, simply and securely and require no bracing. Day#1 The first activity consists of erection of vertical reinforcement bars and one side of the vertical formwork for the entire floor or a part of one floor. Day#3: – Fixing reinforcement bars for floor slabs and casting of walls and slabs. Day#4: -Removal of vertical form work panels after 24hours, leaving the props in place for 7 days and floor slab formwork in place for 2.5 days. Same formwok can be used for 1000 times. Same Formweork can’t be used more than 10 times. Never Miss an update Click on “Allow US” and make us allow or Click on Red notification bell at bottom right and allow notifications. Stay tuned! Are mivan formwork and reckli sheets related? we are work with MFS formwork and reckli sheets . Congratulations ! 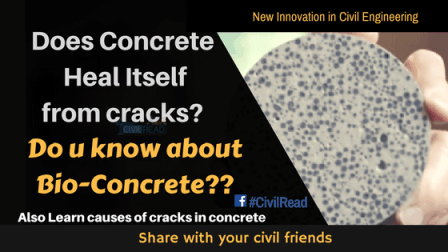 A very precise document.Would you know the cost reduction in using falgi cement in concreting with mivan.what are implications on strength in high rise structures. how can insulation materials be put while using mivan formwork? Which insulation materials could be used and what would be the addition cost attached to it? Mivan formwork is finding its way to Chennai city and they are the perfect solution to the demand for units in affordable housing sectors. One of the ingenious construction techniques developed. COST AT SITE NOIDA U.P. Mivan shuttering cleaning chemical solution to removing rust and concrete build-up on aluminium formwork. It also known as Katharos-AL-301. Katharos-AL-301 is innovative chemical solutions for cleaning aluminium shuttering plates. Mivan shuttering cleaning chemical quickly removes hardened concrete. It save the time and cost in grinding and cleaning. By using this chemical, we can prevent damage of aluminium plates due to grinding. 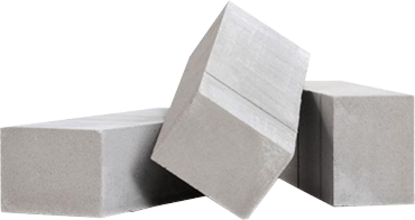 The oxidation and corrosion of aluminium plate will not occur by using this product.It reacts with only free lime of cement on aluminium plates.